A versatile hybrid which is capable of strong midlane as well as continuous backend. I’m feeling like I’m really going to like this ball. I can immediately see the versatility. I’ve liked hybrid covers in the past but haven’t had one in a while so don’t have a particular bias towards them. You can see that on a fresh shot, this ball is very capable of controlling the midlane while on lighter or broken down shots, it can turn into a booming swing ball that can cover a lot of boards. This is a high end ball for Roto Grip in the Crown line so you know what to expect as far as price. No surprises here. This is a brand new core, first used in the Theory and a Hybrid cover in a high end ball. Like I said, this is a brand new core for Roto, called the Triliptic. It appears to my eye as an evolution of the Nucleus II core. At 2.49 RG and a .058 Differential, it has a mass bias of .013 (for a 15 pound ball). As has been typical for many high end lines, this is an early revving core, doing the bowlers’ work for them. The differential is very high meaning you can see some pretty decent hook with a lot of flare possible. The cover is part of the new Theory line, called the Insight Hybrid Reactive. It’s finished at 1500 polish. Basically, the cover has some teeth underneath that polish giving it the versatility of a pearl and solid combined. Of course, you can make different surface adjustments based on the reaction you want to see and lane condition you face. What I’m seeing is a ball that can really face a variety of conditions with this cover. I’ve seen the Theory in action and that ball is very early and very aggressive. This hybrid cover allows it to be very clean through the fronts, which allows the core to take over the midlane and further down lane. Usually I like to keep equipment out of box finish, but I have a feeling that I will be very comfortable playing with this one. So far, I’m quite impressed by this hybrid cover. Right away, I was very impressed with this ball reaction. I am able to calm down the entry angle quite nicely by putting this ball in the oil and I can generate high entry angles by putting in the dry. For example, I can get the entry angle down to the likes of the Motiv Cruel that I recently reviewed. That type of midlane read and lower entry angle gives you a ton of control. You can really take control of the midlane and not worry about a huge overreaction on the backend. On the other end, I can also generate high entry angles and a big backend move by pushing this ball into the dry. That reaction is very similar to the Hammer Midnight Vibe, for example, but much more midlane control. That’s quite a varied range of reactions. I have to say it’s fascinating to see a ball capable of routinely cutting down entry angle and acting like a control ball and at the same time be capable of a skid/flip-like reaction. It’s pretty clear that this will be a ball that bowlers can start with and continue with deep into a league night. I had been personally struggling to find a ball I can use on a fresh shot and still retain enough energy a game later when the shot breaks in. I was able to use this ball for 7 games straight, from a newly oiled 41ft shot. After 7 games, I was still able to chase the oil line, get a nice deep trajectory, and still have all the carry I need. You can see the different trajectories in my video. I’ve always liked the idea of stronger cores in weaker covers. I’m not saying this cover is weak, but the hybrid cover is slightly weaker than the core, in relative terms. The hybrid cover allows the ball to push through the heads very cleanly, thereby allowing the core to do it’s thing just a bit later. That translates to a very versatile ball reaction, one that I think I will almost certainly keep in my bag. I think this could be a benchmark ball. By understanding this ball reaction, you can decide what you want to do. If you need more more control of a tougher condition, you can either dull it down or go with the Theory. If you want to have more entry angle on a medium condition, you can go with a medium strength core like a Nomad Dagger or Columbia Burst. Then if you need a longer reaction, you can drop to something like the Dark Star or Hammer Midnight Vibe. However, if you were only going to have one ball, this is the type of ball that can land in that one-ball bag. Watch the video and you’ll see the reaction comparisons to a couple of these balls. Watch carefully the difference in backend reactions. I’ve also had a chance to take the finish down to 2000 abralon without polish. It was a touch more predictable, and actually provided a touch more obvious transition from hook to roll. I was hoping this finish would allow it to handle more oil, but it doesn’t quite give it enough bite on fresh med-heavy conditions. If you’ve read my initial review, my overall rating was a little higher. I’ve had the chance to evaluate on a heavier volume which has provided more feedback. If you bowl on heavy or medium-heavy conditions, this will be the go to ball after your Theory or other hook-in-a-box solid is too strong. On a medium to medium-light pattern, this could be a first ball out of the bag. Still, this is a very versatile ball. You can surely create a more control type reaction by taking the polish off the ball. I haven’t thrown the ball on a desert so I can’t say how it will fare on that condition. However, after 7 games on a medium condition, this ball was still easy to get to the pocket without pressing. The hybrid cover and strong core really walk the line and can go either way, strong or weak. I can see many people using the Infinite Theory as a benchmark ball. On a fresh heavier shot, you will know right away if you need more ball. The shot is consistent and not as over/under as a pure pearlized ball. There you have it. 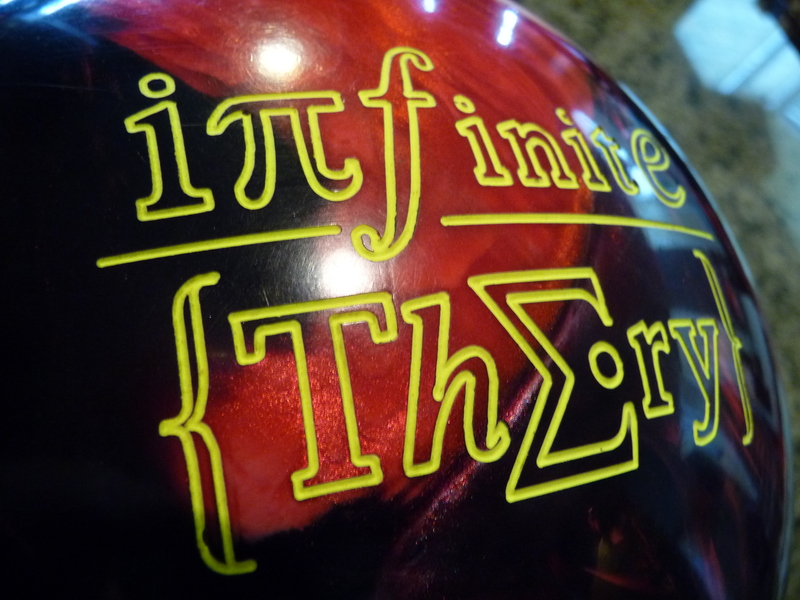 The Infinite Theory is likely going to be a benchmark ball for a lot of people. Very versatile and covers a range of ball reactions. Pick the right reaction and have some fun! 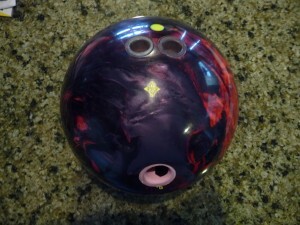 On Thursday night I went to http://www.ballreviews.com and looked for the video of the Roto Grip Infinite Theory. It was posted at your website. It was late at night and after watching you bowl on the fresh condition I decide to see the rest of the video on Friday. On friday and this morning there is only the digitrax review and no video on the Ball reviews website or your website. Is there any reason why you pulled the video? I tried to e-mail you at http://www.tamerbowling.com and it would not go through. Hi John, Thanks for noticing that. I’m not sure what happened but it’s back up so check it out. You’ll also be able to post to the site now.